“Upon a Fit of Sickness” details Anne Bradstreet’s confrontation with death at the young age of 19. A few years after her arrival in Massachusetts, Bradstreet fell very ill with a fever and believed that there was a strong chance that this disease would end her life. In the poem, Bradstreet does not despair in the face of death, but instead faces her future without fear, writing, “All men must die, and so must I/ this cannot be revoked” (Lines 5-6). Her embrace of death at a young age might seem surprising for twenty-first century readers, but it was perhaps a more common attitude among seventeenth-century teenagers who were surrounded by death so much. 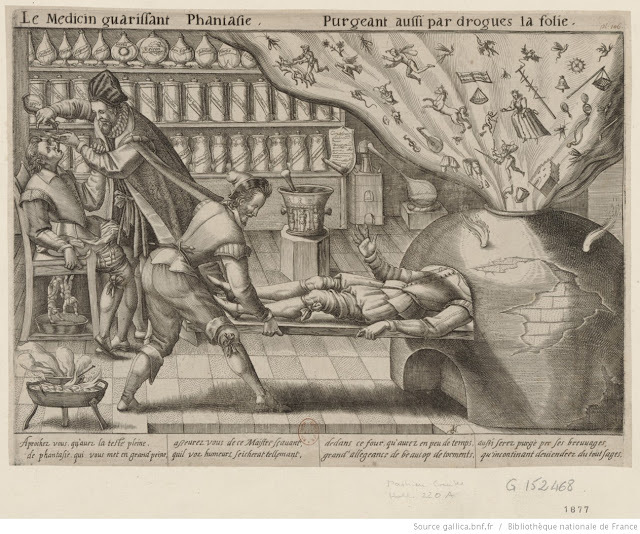 Medicine and healthcare in the seventeenth-century were so poor that when someone got sick with even a common illness, survival rates were very low and people became normalized to death. The lines of “Upon a Fit of Sickness” also show that she was very humble and even in her most honest moments with herself she did not think that she was better than anyone else and that she could not cheat death. "Le Médecin guérissant Phantasie," Mattheus Greuter, 1620 (Bibliothèque nationale de France). The seventeenth-century equivalent of a brain scan reflects some of the medical thinking of Bradstreet’s day. For me, this poem makes life seem quite trivial. It seems as though Anne thought that life was just something very temporary and tedious and that people are just living to die. This is very apparent to me when she says, “Our strength doth waste, our time doth haste/ and then we go to th’ tomb” (Lines 14-15). This depressing acceptance of death continues throughout the poem, suggesting that nothing we do really matters and at the end of the day we all just die anyways so who really cares. At the end of the poem, Bradstreet finds “victory” in death through her faith, which is a bit more uplifting than the resignation at the outset. This shows that even though she was at her lowest point, she found comfort in the inevitability of death and God’s promise of salvation. As morbid as this might seen, Bradstreet’s early brush with death ignited in her a passion that she was not aware she had--she became a poet. She was able to turn to poetry in her darkest hours and create something special. This was the first extant poem that she wrote in her career and this lead to a lot more poetic success for the rest of her life. and then we go to th' tomb. O bubble blast, how long can'st last? ev'n as a word that's speaking.